The increase of backcountry winter sports, meaning activities outside the official boundaries of ski resorts, brings a lot of additional stress to alpine habitats and wildlife. Animals living in the mountains already face more and more difficulties due to climate change. Habitat degradation and loss due to slopes and ski lift constructions, the ongoing noise of artificial snow production and the daily presence of people negatively influence the species living in the areas around ski resorts. 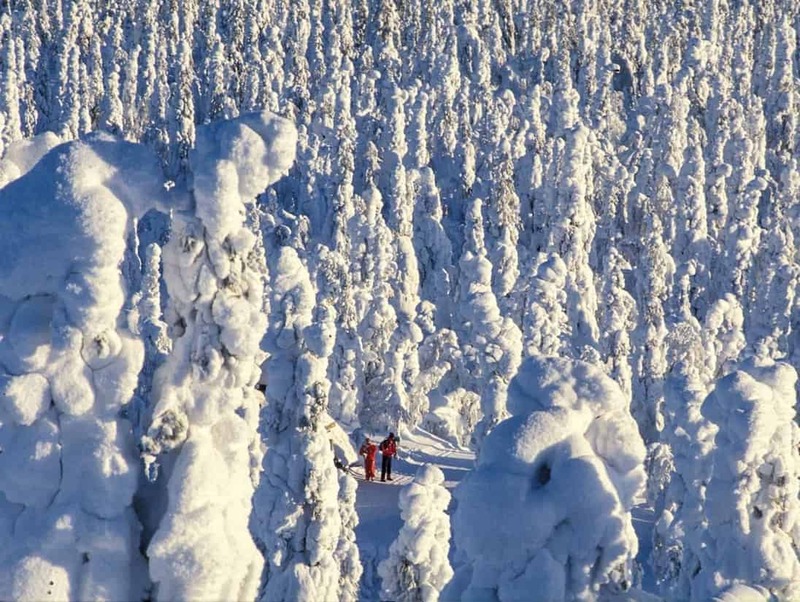 However, the ever-expanding tourism industry rarely takes them into account when promoting activities like backcountry skiing or snowboarding. Enjoying wintery mountains and forests on our skies, snowboards or snowshoes often lets us forget that this winter wonderland is the home of numerous wildlife species. Not only deer, chamois and ibex but also snow hare and many bird species, like black grouse, wood grouse and snow grouse, live in these alpine environments. Most of them retreat to the forest and its edges during winter to find shelter and food. The increasing numbers of people enjoying winter sports leave more and more scars on the places these people are seeking to enjoy. Scaring wildlife and harming their habitats by damaging vegetation, clear cutting forest and compacting soils are the most significant impacts. Slopes and lifts lead to habitat fragmentation and consequently decrease the habitat quality for many birds and mammals. Declines in species diversity and population numbers have been observed in touristic areas all over the Alps. In most cases these declines can be linked to the intensification of winter sports. As a consequence many of the species living in these areas retreat to areas away from the resorts. However, the rising popularity in winter sports and also backcountry activities outside the marked resorts are increasing. These activities still come with negative influences to the animals living there. Particularly, free-riding skiers and snowboarders often, repeatedly, scare resting birds and deer. Animals in alpine environments have different ways to adapt to the harsh winter conditions. Particularly the cold temperatures and the amount of snow makes movement more difficult and exhausting. Additionally winter leads to a reduced food supply. These conditions demand some kind of survival strategy. Strategies include isolated winter furs or feathers, hiding out in protected shelters, reducing the body temperature, and movement. The most important form of adaptation though is to save energy. This means that it is essential for the survival of wildlife to not be disturbed during this sensitive period! Being disturbed by skiers or snowboarders will cause wildlife to flee, which means a significant increase of their stress level and energy output. The deeper the snow the higher the energy consumption of the animal as it moves away. This can have devestating effects on the animals. Fleeing disturbances and looking for new shelter reduces the time the animals has to find food, which is scares in winter anyhow. This will have negatively influence their physical shape wich can result in lower success rates when reproducing, sickness or even death due to exhaustion or starvation. A scientific analysis across the southwestern Swiss Alps found that birds in habitats frequently disturbed by humans had significantly higher stress levels that birds in undisturbed habitats. Animals have two ways of reacting to repeating disturbances. The first one is habituation. Habituation mostly occurs when animals have the chance to avoid regular, similar disturbances. For example along a marked and highly frequented route or around cabins. Such disturbances are predictable and the animals do not react with fleeing or stress after a while. The second form of adaptation is sensitisation. It is the opposite of habituation and causes the animals to feel even more stress with every disturbance they experience. Their urge to flee increases and they run away even further or completely give up important locations for feeding, shelter or mating. Sensitisation mostly occurs when animals are repeatedly and unpredictably disturbed. For example by freeriders. The animals’ intense reactions mostly stay unnoticed as they hide or already flee before being seen. Sensitisation also makes the animals more vulnerable to predators. There are ways to enjoy the wintery mountains and forests without causing harm to their inhabitants. The Leave No Trace Center for Outdoor Ethics made a comprehensive short clip on the 5 most important things to consider when recreating in winter. Find the 5 most important Leave No Trace tips here. do not leave any garbage behind and do not destroy obvious animal shelters! Wow, 300+ applicants for our next Wild Volunteer!